If I had to describe a bad hair day, I would have include the words, flat and frizzy. This happens most often on my "second day" hair days. Since I wash my hair every other day, I still want my hair to look fresh with a bit of lift on the second day. 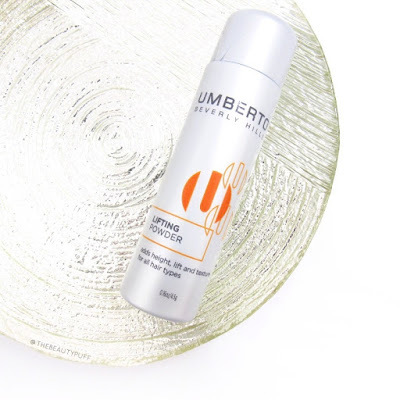 The all new Umberto Lifting Powder has been helping with volume as well as freshness since it also works to absorb oil. I love a multi-tasker! This powder is incredibly light-weight and remains undetectable in the hair. All you need is a gentle tap to dispense the product to the root of the hair, or wherever you need volume and texture. Just work the product in a bit with your finger tips, that's it! You an use it before styling, or after, depending on your desired look. The Umberto Lifting Powder not only provides lift and texture, but it also helps control frizz and absorb moisture. I wouldn't say this is a replacement for dry shampoo, but I do like that added feature of this product. I typically target the application of the Lifting Powder, as opposed to dry shampoo which gets applied more sporadically. Whether you are refreshing your second day hair, or needing more texture and volume for your next 'do, this is definitely a must-have! Best of all, you can find it at your local Target or online at Target.com.